out of the various skeletal problems that can affect dogs throughout their lifetime, hip dysplasia has earned the highest ranking at an 8% chance of occurrence. the heritable condition is one of the hip joint, where an interlocked ball and socket (femoral head and accetabulum) develop abnormally as the canines grow. environmental factors include diet, gender, and amount or type of exercise, along with a soft tissue laxity that causes agitated friction in the specified area. once the disease reaches a level of concern, the next course of action is to consult a doctor who specializes in physiotherapy and hydrotherapy. 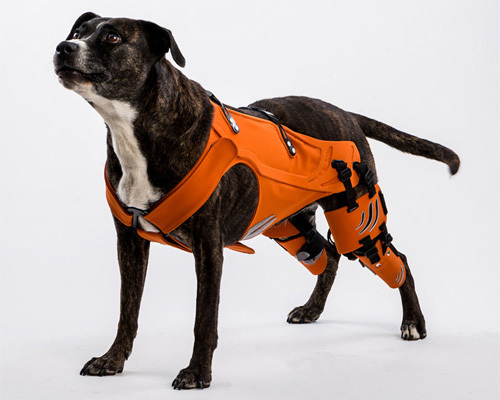 hoping to provide a solution for dog owners everywhere, industrial designer galia weiss‘ research into hip dysplasia has led to the creation of a harness called ‘hipster’. in order to prevent the joint components from disconnecting, the device pulls up and strengthens the hip muscles to keep the femur in position. 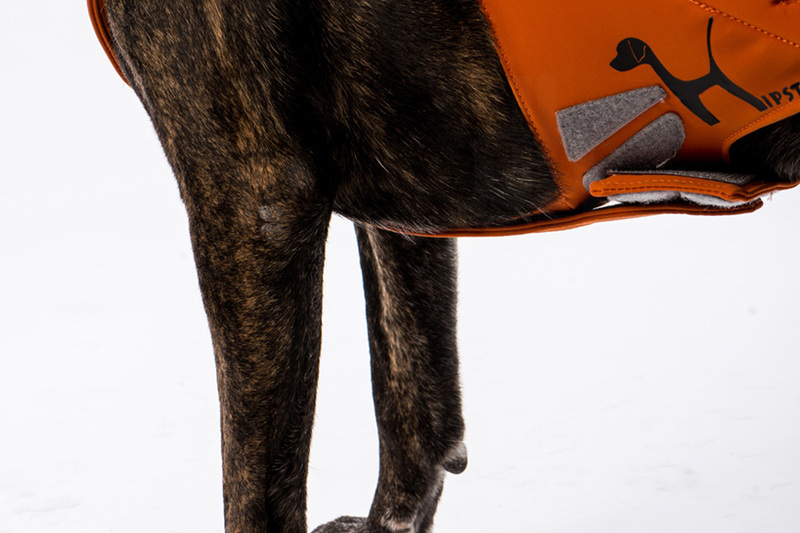 an integrated, rigid frame has been designed to avoid any additional burden on the dog’s bottom, while providing a resistance for the straps located on the back leg muscles. weiss believes that the work can improve any pet’s condition after a month. dressing the dog up with ‘hipster’ is easy and intuitive through the implementation of velcro fasteners. 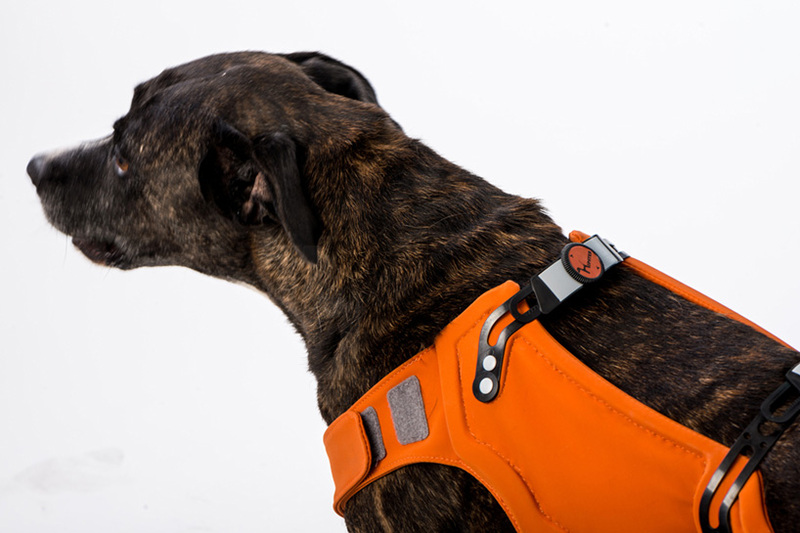 two adjustable ratchet straps located on the back of the harness allow for the accommodation of different canine sizes. 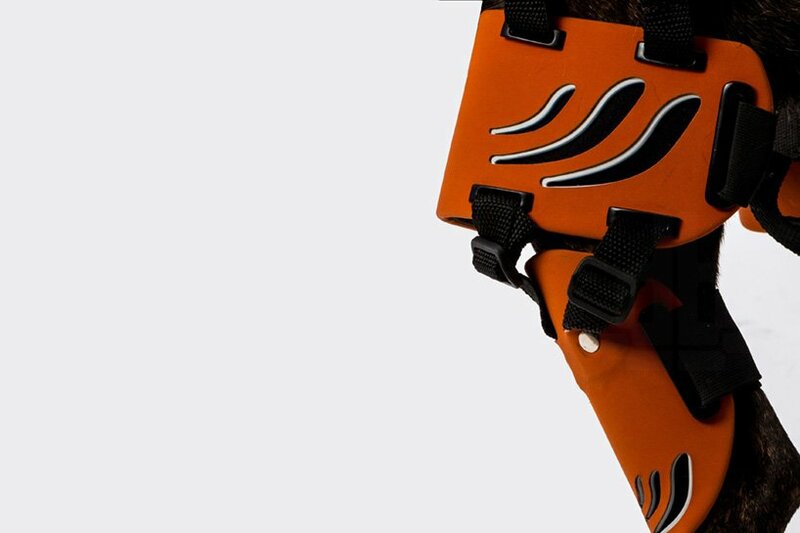 towards the front, the material loops through a chest buckle that stabilizes the instrument as any movements are performed. the fabrics used are machine washable and are available in multiple colors. Thank you very much Galia Weiss for helping animals. Beautiful and useful product. 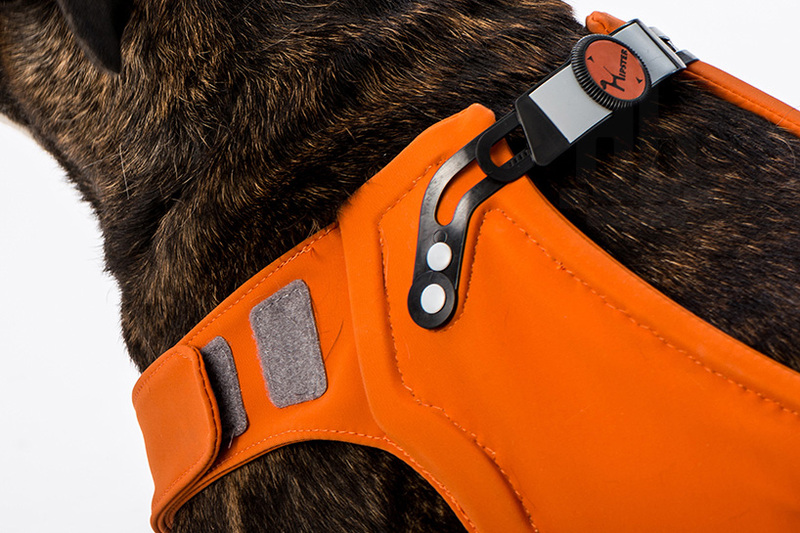 My dog has severe hip dysplasia–where can I purchase this specific harness? I hope this works out. Its wonderful to know of people thinking in these terms. Man, that dog got a lot of treats. Hello, my dog is a labrador and he also have a severe hip dysplasia, so I’m very interested to try this hipster harness. Could you tell me where can I buy it ? Where can I purchase your harness??? Or alternatively, when will it be available? Hello Galia, My husband and I are very interested in your product. How do we contact you? Please contact me at [email protected] . My 6 month old Chihuahua has a bone deficiency on her left front leg(according to the vet,it’s too soft) & has trouble walking that it now affected her body shape. Will you have something that is for the front legs?Any infos would be greatly appreciated. Where can the harness be purchased? Are you aware that most hip dysplaysia is due to the bones themselves developing abnormally? The acetabulum (hip “socket”) is too shallow and/or the femoral head is shaped wrong. Therefor the theory of “keeping the femoral head in the socket” would actually cause the dog more discomfort. Is this product supported by any veterinarians? 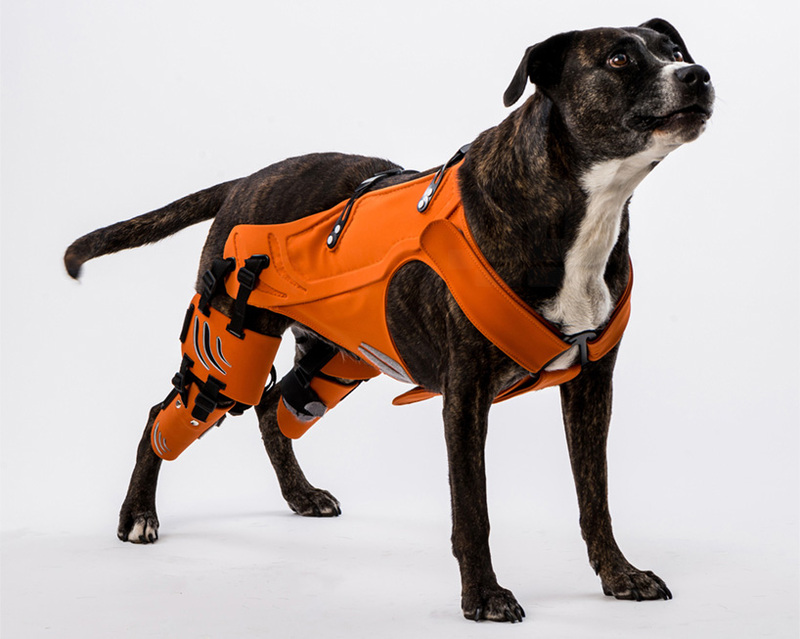 This is a design project aiming at rehabilitating dogs with hip dysplasia, and has been developed with a veterinarian. It has not been released to public yet. Can we get on a list to be notified when it becomes available to purchase? VERY interested in this for my 7 yr old Golden Retrieve mix that was diagnosed when she was 10 mos old. Could not afford hip replacement surgery, so have just been relying on medication, the right mix of weight control and exercise to keep her comfortable. Would love another tool to help my girl! I’m so very excited to hear about this! I have an elderly dog with hip dysplasia and I have a friend who has a young dog with a genetic condition that has caused him a lot of discomfort and trouble getting around. We would both be very interested in getting these, and I would very much be interested in volunteering my dog for a case study. I’m certain my friend would as well. How can we get get in contact with you or whoever is doing the research? Interested in this product for a 63 lb, 17 year old dog full of life but now experiencing hip problems making it difficult for her to stand and sit, and even squat to go to the rest room. I can see it is starting to hurt her. We have had her since she was 8 weeks old, and this is hurting us to see her like this. Vet gave meds, but meds make her lethargic and do not address the over-all problem. Thank you for information that hopefully include how I can purchase and the cost. Thank you so much for inventing this. My heart is ripping out of my chest to see my dog go downhill so fast. to watch him drag his back end, until he gathers strength to kinda walk. I have to retrain him to walk on the grass, so he won’t get hurt dragging his leg occasionally . I got hurt bad 2 years ago, and am trying to get stronger, and he has been by my side every moment. We used to go out and about, playing, two mile walks, all the time. I am so angry that my employer that they didn’t take my injury serious until it was too late. Our play time was very minimal. Back injuries are the worst, and I feel so guilty that I couldn’t handle the pain, because I lost two years of play time outside, with him. Now that I have improved enough to go for a short 2 block walk, he can’t. Playing inside just isn’t the same. I can’t lift him, to take him on rides. I lost my job, I can’t lose my dog, he is my Bubbie. Thank you again for dedicating your time, and I very much need to get this for him. God Bless you, I honestly could hug you, because I felt so numb with the thought of having to put him down. He is so very loyal, and loves me even if I let him down. My heart is crying out for you and for your body, It made me cry to read your story…my passion for helping animals has brought me to design this product, but unfortunately it is not in a stage of being produced yet and Im working on that. I wish the best for all the dogs who suffer from hip- dysplasia. and I hope that in the very close future this product will help the dogs who need it. I have a 14 year old boxer with displasia caused by an injury as a puppy. She has done fine until recently as the muscles weaken. We’re and when can we get this harness? My 16 year old Corgie Boarder Collie is in great shape, but has severe hip dysplasia. We walk her several times a day to keep her muscles strong. Can not wait for this product to be released to the public. I would love to purchase asap. Can you let us know when it might be available? Looks like you have a great product. You should begin a mailing list to all of us looking to help our beloved animals. Nikki a German shepherd has been through a flipped stomach a torn acl and a lump removal from her back leg and is beginning to need such a product. Please start a list so others will know as soon as your product is available. I am a k9 hydrotherapist. I assume the symptoms of hip dysplasia improve with this product because of building muscle mass Strong muscles help to support ill fitting joints. Would like to know about the availability of this product. Get this on KickStarter or IndieGogo NOW!!! You would be so so so succesfull! My dog died last year (of unrelated heart problems) and she had hip dysplasia, vet told us that “well, there just isn’t much we can do”. Her quality of life for the last year would have been so far improved by this product and her heart condition probably would never have been an issue if we could have got her to be more mobile. 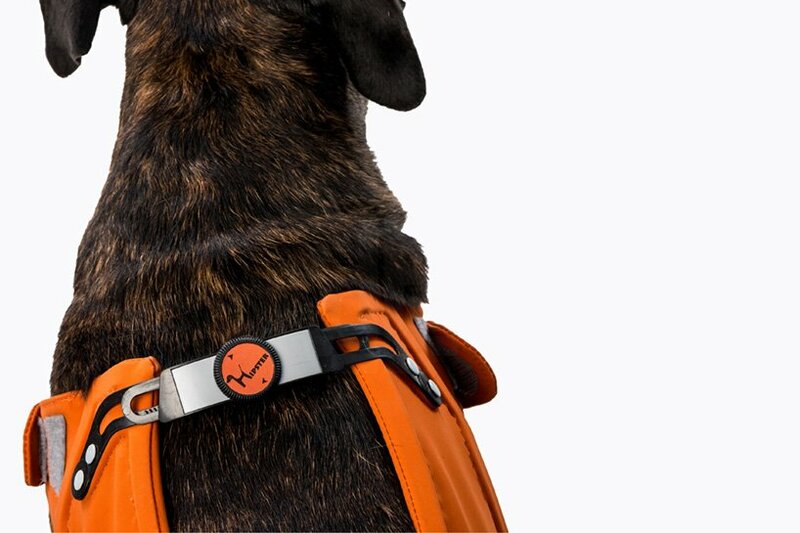 I would back this product just to get it funded and the reaserch done… Seriously… I don’t have a dog now, and probably won’t for a long long time, but I would most surely put money into this (not much, as I’m not financially well of, but I would want to help out). Please get this great idea out there!!! Nice video for an ingenius product, but please correct all the typos! It makes it hard to take it seriously. Beautiful design. Add me to the list of potential clients. From the coments, you can see the need, even if only to limit the discomfort. Kep up the good work. I have a newf with hip issues and he is only 11 months. I would be very interested in this product when it becomes available. Please add me to whatever list there is. I’d be quite keen to use this and agree with the prior poster to put it on KickStarter or IndieGoGo and we’ll all support you! Also very interested in this harness for mastiff which is over 150 lbs. Hope it is available soon. I am very interested in the Hipster for my dog. She is a lovely Boxer I have had her for 12 years and within the past month in 1/2 she has developed Hip dysplasia. I believe her late pregnancy caused weakness. I have been searching endlessly for a device to help her walk on her own, so when I saw your device I was so pleased. Could you please let me know where I can purchase one or when it will be available to he public. I am very interested in buying the Hipster fo my puppy. She was born with hip dysplasia, and it is starting to get worse. She is having troubling getting round and playing with the other dogs. Please, my beautiful little rescue Labrador girl has the most severe hip dysplasia and she wrenched one side when we were in the forest yesterday. She’s at the vet’s at the moment, having x-rays under a general anasthetic. I know your Hipster would help her so much. Please – when will it become available? First of all I admire your idea and your project, congratulations! Please make this product come to the market, even in small quantities for a start. It will help so many dogs who really need it. I will not get into more details such as “shes great and loyal” since all dogs with or without dysplasia are part of our souls! Looking forward for your prompt news! I have a Husky/Wolf who I recently rescued. She is young 2-3 year but it is very clear when she walks that she already has hip problems. Would using this product once a week or so throughout her life reduce the inevitable pain she will feel in old age? Thank you for your love of animals and attention to detail in conquering the heartbreaking disease of hip dysplasia for our most beloved family members. I have a 6 month old Šarplaninac whom was just diagnosed. Her spirit is high and so is her energy and his recent development of a limp makes her play time have an abrupt halt. Please let me know when your brace is on the market. She is already a healthy 70lbs and will grow to be 130lbs if you would like to research or observe a larger breed with your product. Are these available for purchase yet? I am interested. Are these available yet? My vet is interested in me trying it. –where can I purchase this specific harness? I have a female black mouth cur/lab mix. She is only 4 years old and has hip dysplasia in both her hips. She loves to run, but even if she does minimal running she starts limping and is clearly in pain. Does this product come in sizes and is it available and at what cost? Please let me know, is it possible to purchase it? If so, where I should go to inquire about it. 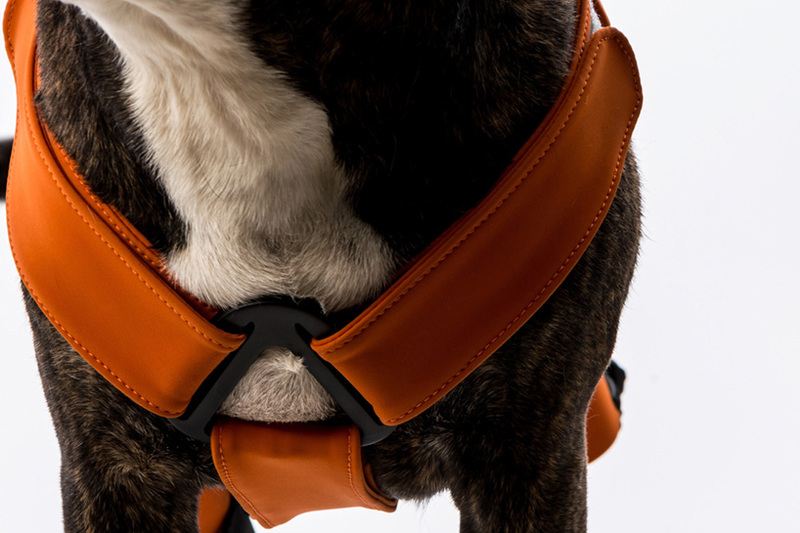 Galia Weiss’s Hipster Harness is a phenomenal design. My Kerry Blue Terrier needs desperately this harness. Is it possible to purchase it? I want to help my beautiful friend. We are interested in this for our male great Dane, this would I believe help him a lot. Can someone please contact me about this? Where can I buy this wonderful harness? My dog is in desperate need. Desperately need a brace for our family pet, 4 year old German Shepard. Can you please contact me! My German Shepherd suffers from severe hip dysplasia of both hips. If this truly work, and I hope it does, this would help him greatly. Is it available for purchase, if so where? I can not stand the pain when I see my Rottweiler Rocco in pain. Last night the Vet diagnosed him with hip dysplasia. Please I need to buy one. Please let me know where can I get one. My dog Murphy has been diagnosed with hip dysplasia. He has fallen several times and I dread the thought of it getting so bad that I will have to put him down. The very thought of it brings tears to my eyes. Your product looks amazing and I feel it would really help my pup. Would you please let me know as soon as it is avail for purchase??? Or where it is available to purchase. Thank you so much for caring so much about animals to create this product!! God Bless You!